To install the software on Mavericks or Mountain Lion first download the DMG file using the link on the downloads page. Then open the downloaded file which mounts the disk image as a folder in Finder. Next open Finder and click on the DSLRRemotePro_for_Mac_v1.x drive which can be found listed under the "Devices" heading. Then drag the DSLRRemotePro icon to your "Applications" folder to install it. Alternatively double click on the DSLRRemotePro icon DSLRRemotePro_for_Mac_v1.x drive folder if you want to run it without installing. If this happens please click on "OK" to close the warning window and then hold the Ctrl key down when clicking on the DSLR Remote Pro for Mac program icon and select "Open" from the menu. 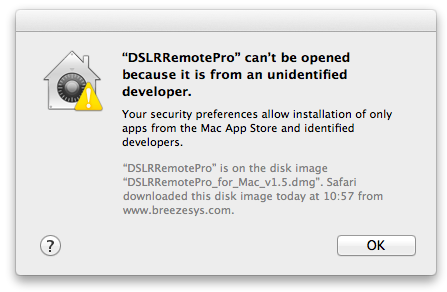 Mac OS X 10.5 Leopard support: Please use DSLR Remote Pro for Mac v1.5. Later versions of DSLR Remote Pro for Mac will not run on Mac OS X 10.5 Leopard because the latest Canon camera control libraries do not support Leopard. Mac OS X 10.4 Tiger support: Please use DSLR Remote Pro for Mac v1.4. Later versions of DSLR Remote Pro for Mac will not run on Mac OS X 10.4 Tiger because the latest Canon camera control libraries do not support Tiger.